Thursday, March 5 1908 -- Charles Comiskey's White Sox arrive in Los Angeles for spring training, and the city rolls out the red carpet for them. A morning rainstorm only dampens the festivities slightly, and the Sox get a chance in the afternoon to do some very light training. Throngs of Angelenos are on hand to gawk at the mighty Major Leaguers. Obscurities of the Day: Pinhead Pete, Freddy Frappe Filosphizzes, Stone Age Stuff and more! In our final post about the creators and features associated with the Chicago Tribune's short-running but pretty darn astonishing Crazy Quilt series, we have to tie off some loose ends. Luckily the Tribune makes that pretty convenient by putting all those loose ends in a nice little package. In the teens the Trib seemed to be real serious about giving Sunday funnies readers a lot of bang for their buck. While the covers of the Sunday section were graced with lovely full-page strips, at least one page of the interior was jammed up with a whole bunch of one-tier strips. It was this interior page that became Crazy Quilt, by jumbling some of those shorty strips, and some new items, into one Frankenstrip. 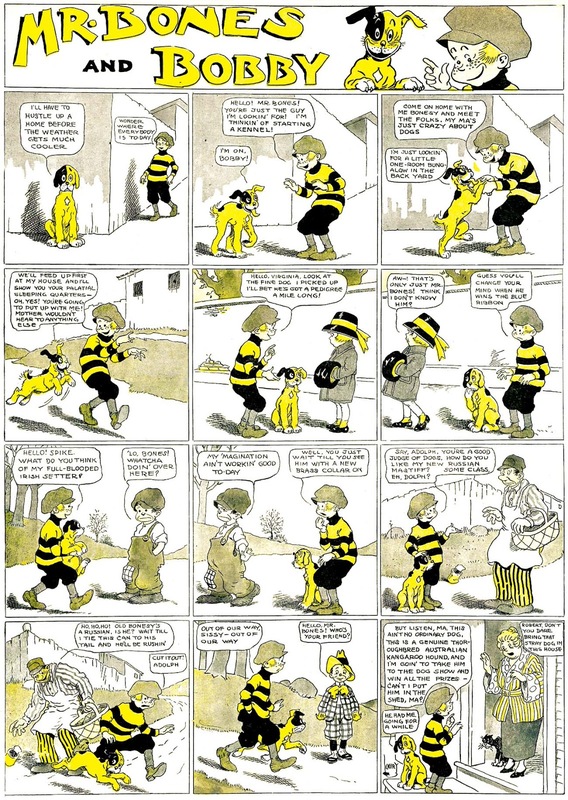 After Crazy Quilt ended, many of the strips continued as standalone features, and even some of the panels. The panels were all thrown together on a single tier as you see above. It was in this way that Dean Cornwell's Stone Age Stuff and Freddy Frappe Filosophizzes continued, as well as Quin Hall's Pinhead Pete. Stone Age Stuff and Freddy Frappe both continued until January 10 1915, and even appeared as strips on one occasion, November 8 1914. 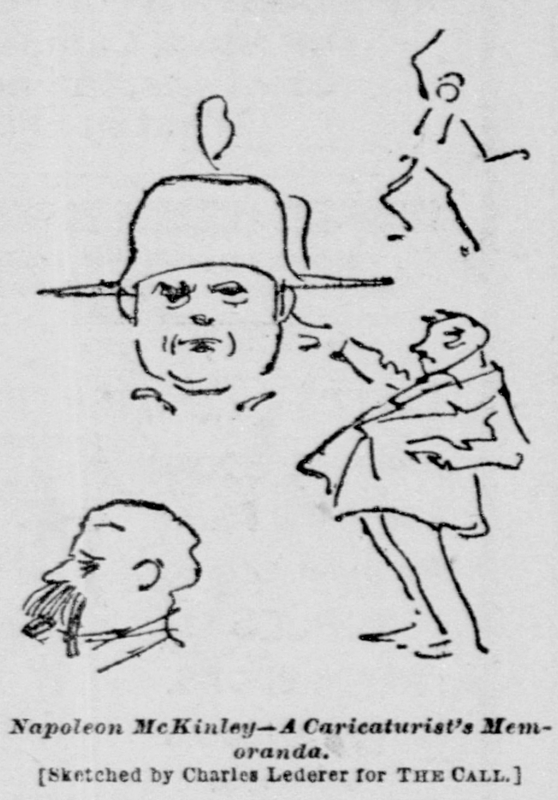 Pinhead Pete continued as a panel until August 30 1914, but then returned as a full-fledged strip, replacing Hall's Genial Gene, on November 1 1914. 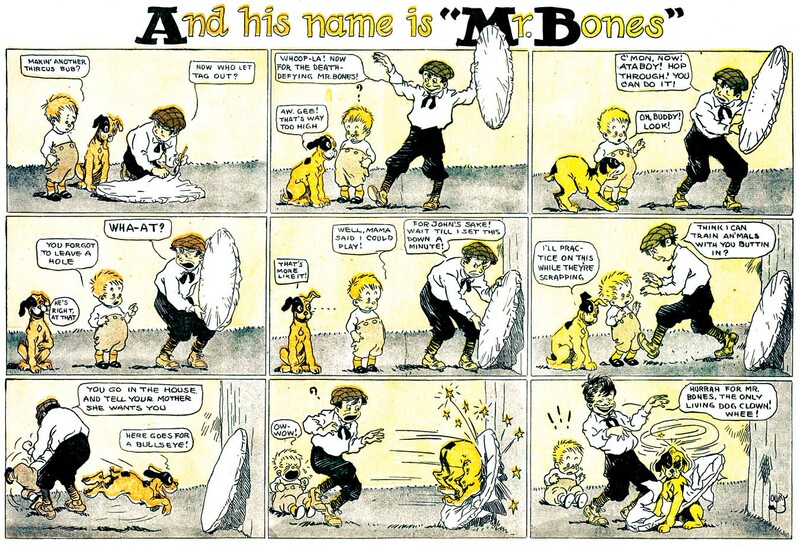 The strip version ran until January 10 1915. The panel tier included other non-series stuff by Hall and Frank King, plus a never-really-titled series with a black porter named George. Quin Hall, who had a delightfully playful wit as a cartoonist in his early days, contributed Genial Gene to the Chicago Tribune's Sunday funnies section starting on January 25 1914. 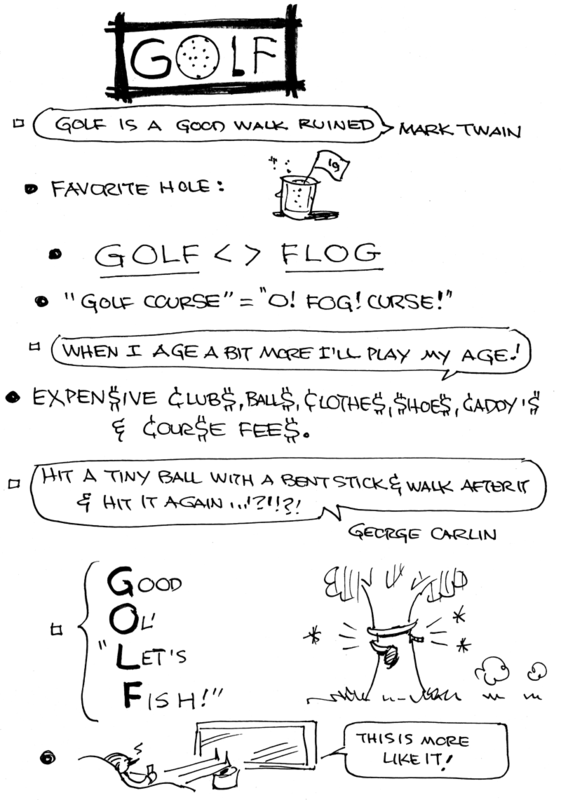 Gene was a knowing pawn in Quin Hall's games in some of the strips in this series, which broke the fourth wall on occasion (see especially sample #4). In these simple mostly one-tier strips the plump and mild-mannered Gene tried to woo Emily, while Pinhead Pete got in the way.There wasn't much more Hall could do in his small space, but his jaunty dialogue made it a fun read. Genial Gene became a patch in the Tribune's Crazy Quilt feature, but returned afterward to once again appear on its own. It last ran on October 25 1914, and was replaced the next week by the now headlining Pinhead Pete. Gene made a final appearance in the new strip on it's first week. Veteran newspaper ink-slinger Everrett Lowry started his Chicago Tribune dog feature, And His Name is Mr. Bones, on March 22 1914. At first the stray dog and the strip itself were unnamed, and Lowry ran a contest to name the mutt. Soon after the debut of the strip, the still-unnamed character was pressed into service in the Crazy Quilt jam page. 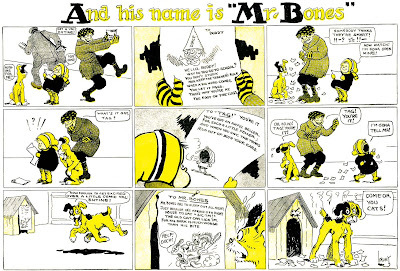 When Crazy Quilt came to an end, the next week the dog had, with no fanfare, been named Mr. Bones and the strip titled And His Name is Mr. Bones. Mr. Bones shared his philosophical ramblings in the Tribune until January 24 1915, at which point both the dog and his creator dropped out of sight for a very long period. 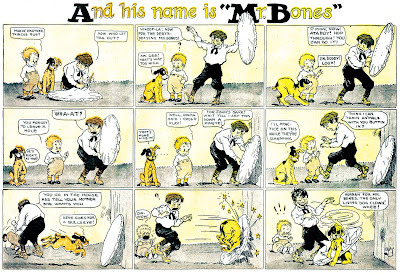 Finally, over four years later, acting as if the strip had merely taken a short vacation, Mr. Bones was back in the Trib's Sunday section on May 4 1919. Mr. Bones went right back to doing his business until November, when Frank King abruptly dropped his popular Sunday feature, Bobby Make-Believe. First Frank Willard was assigned to continue the strip, but that only lasted two weeks, and then Lowry was elected. Apparently not too keen on the assignment, Lowry tried to turn it into a vehicle for his character, renaming the strip Mr. Bones and Bobby. 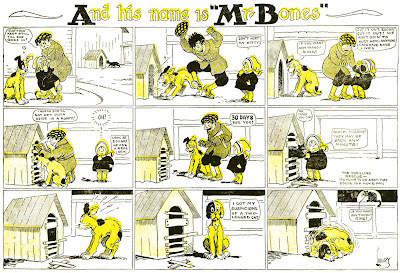 Even though Lowry was at the time using a kid character in his Mr. Bones strip, apparently it did not sit well with him to take on King's character. 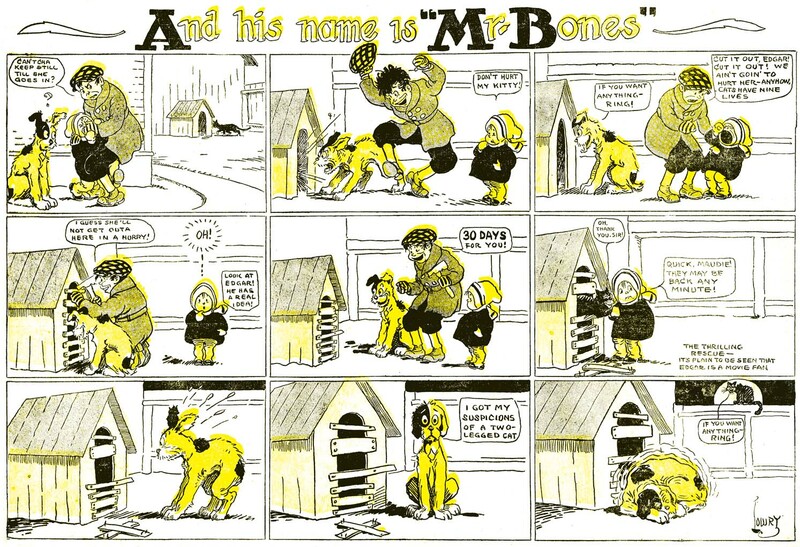 After just two weeks, Lowry was released from the assignment and the Mr. Bones strip went back to it's normal self, with Bobby Make-Believe now consigned to the ashcan of history. I get the feeling the Bobby Make-Believe episode may have left a fatal wound in the relationship between Lowry and the Tribune. The strip did continue for five months, ending on May 5 1920, but it was Lowry's last work for the Tribune, or for that matter, any major paper or syndicate. Thanks to Cole Johnson for the images! A Talk with the Artist. The Best Newspaper Caricaturist in the Whole Country Speaks of His Work. "It's one thing to make a caricature and quite another to find the subject, and my experience has been that a successful newspaper caricature artist must have plenty of nerve and carry it with him wherever he goes." It was Charles Lederer who voiced this sentiment. You may judge of its truthfulness from the fact that there is not a man in all America better qualified to speak on the subject. It is safe to put it even stronger—there is no man so well qualified, for Lederer is admittedly the best newspaper caricaturist in the country and the highest paid newspaper artist. The Chicago Herald pays him double the salary of any other first-class artist. Other papers have offered him more, but he prefers Chicago. He was talking to a Call reporter yesterday afternoon in his rooms at the Palace Hotel and all the while assisting a tall, stately looking, gray-haired lady—whom he introduced as "Mrs. Lederer, my mother"—to pack two stout-looking trunks that were already labeled "Monterey, Cal." "You know you can't ask Governor So-and-so to sit down and let you make a caricature of him. You've got to engage him in conversation under the pretense of being a reporter, and while he thinks you are taking notes of what he has to say you can jot down some memoranda of his peculiarities and fix his general characteristics in your mind. That's why I say a successful caricaturist must never leave his cheek at home when he's going about on business. 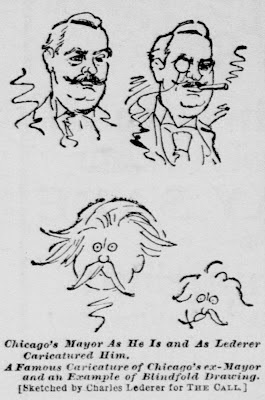 "The best caricatures are made when the artist can have a sitting long enough to sketch the subject's portrait and make memoranda of his peculiarities. "You see, it's a man's peculiarities of facial expression, or dress, or manner of talking that must be caricatured, for the caricature must be true to life, only exaggerated. "Sometimes a well-known man's face is put on a very small body. That may make a humorous picture, but hardly a caricature. "Take a man who wears his hair long and make it ridiculously long, but yet in such a way as not to spoil the likeness; that's a legitimate caricature. Or a man with a large mouth or a peculiarly shaped nose or a characteristic attitude in speaking, or any such things, may all be caricatured so long as the likeness is there." "But suppose a man has no striking peculiarity? Do you meet such men?" asked The Call reporter. "Yes; sometimes. A fair example of that is in Mayor Hempsted Washburne of Chicago. As he was the Republican candidate a year ago, of course it was my duty to caricature him. I had ample opportunity to see the man, but for the life of me could discover nothing about him to exaggerate. "But the job had to be done somehow, so I put a monocle on one eye and a cigarette in his mouth. It made a great difference in him, and the picture caught on and stuck to him till after the election. Here, I'll show you," and taking up a hotel pen Mr. Lederer made some hurried sketches on The Call man's note paper. In about the time it takes to tell it he had sketched a portrait of the Mayor of Chicago as he is and as he looks with the cigarette and monocle. "I found out afterward," continued Mr. Lederer, "that Hempsted Washburne never wore a monocle and was not, as a rule, addicted to cigarettes. "The New York papers afterward said that Chicago had elected a Mayor who wore a monocle and smoked cigarettes.
" 'I wouldn't care if I did smoke cigarettes and wear a monocle, but not doing either, you know, it was tough.' Then he laughed and we shook hands, and I promised not to do it again. "Yes; I did some pretty tall hustling during the national conventions. That's why I'm out here now. Lost my summer vacation entirely on account of them. "And the worst of it was I had to do all my work two days ahead at Minneapolis. Say the work I did on Wednesday couldn't reach the office and be printed before Friday, and when it was published it had to be timely. "Then, too, the very men I wanted to draw most were the ones, usually, who only appeared in public, or where they could be seen, for perhaps five minutes at a time. Say Senator so-and-so offered a resolution in the convention. Well, my caricature of him must be sketched out in the five minutes, or more or less, it took him to read his resolution." "Don't you draw from photographs?" asked The Call man. "Well, that depends. If a man's picture is familiar to the public it is better to stick to it, for the caricature made from the original would probably not be recognized. "But if his picture has not been printed often enough for him to be known by it then the best work can always be done from nature. I had an instance of this in Matt Quay. His photographs are always taken in profile, for very good reasons, too, for his face is positively ugly, though a strong one. "Well, I made a caricature of him at the convention, using a full-face view, but never used it for fear it would not be recognized. It didn't look a bit like his pictures, though it was far more natural. "Men like Joe Keppler of Puck are often misled by the photographs they work from. Keppler came out to Chicago during the convention and was my guest at the Fellowship Club dinner, just to see whether Wanamaker compared well with his picture. Some one had told him that the Postmaster-General's photographs were not natural. And Keppler found a big difference between them and the original.
" 'Why,' said he, 'I've been giving Wanamaker a small, puggy nose, and I find it ought to be large and bulbous.' "
"But most of the weekly paper caricaturists work altogether from photographs. Take Tom Nast, for instance. Do you know he never attended a national convention till he went to Minneapolis last summer? And when he got there he couldn't stay. The excitement made him too nervous, he said, and he went right back home." 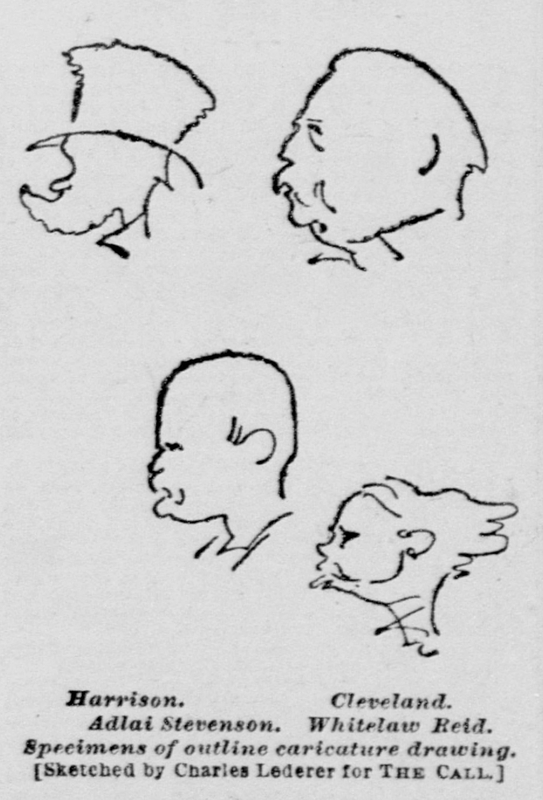 "Are there any rules by which the young artist can learn to be a caricaturist?" "Hardly. It's largely a matter of intuition, I think. It's a separate branch of the art of drawing, and I don't believe it can be taught in the art school. A great deal has been written about caricature, but I never found much of it applicable in practical work. It's born in a man, I think; at least, I couldn't tell you how to do it." "Don't prominent men object to be caricatured sometimes?" "Not a as rule. But that reminds me of Congressman Joe Cannon. He's quite a noted character in Washington. I was the first one to caricature him from life. The result was far different from those taken from his pictures. You can make a caricature more deadly, you know, if you do it from life. "Well, I went all the way to Peoria to get a chance at Cannon from life. When I got to the hall where he was to speak I found the local reporters were to be seated at a table back of the speaker. That wouldn't do me much good, for I didn't care to caricature Cannon's back. So I bribed the janitor to fix me a little table in front of the speaker's stand, so that I could look right at him. "Somehow or other the impression got abroad that I was the Tribune reporter, that being a Republican organ and this a Republican meeting. "Now I'm willing to swear that I did nothing to originate that rumor, but I must confess, too, that when I heard it I did nothing to dispel it. 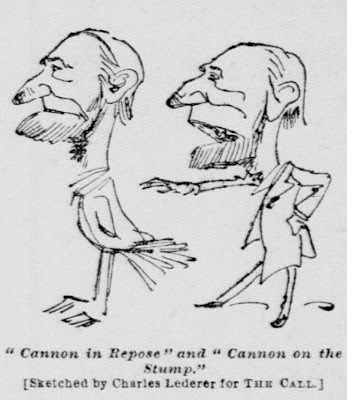 "Of course Cannon would rather have a column in the Chicago Tribune than a whole page in the little country papers. So when he began his speech he fixed his eyes on my table and talked right at me all the time. "He thought I was taking notes of his speech, and sometimes during his eloquent periods he would stride right over to my table. On such occasions I would cover my drawings with a piece of note-paper and make a desperate bluff at writing hen tracks, which I fondly hoped he would think were shorthand notes. "My caricatures of him must have been strong, for I heard afterward that he was greatly incensed at them. I'll show you what they were like." 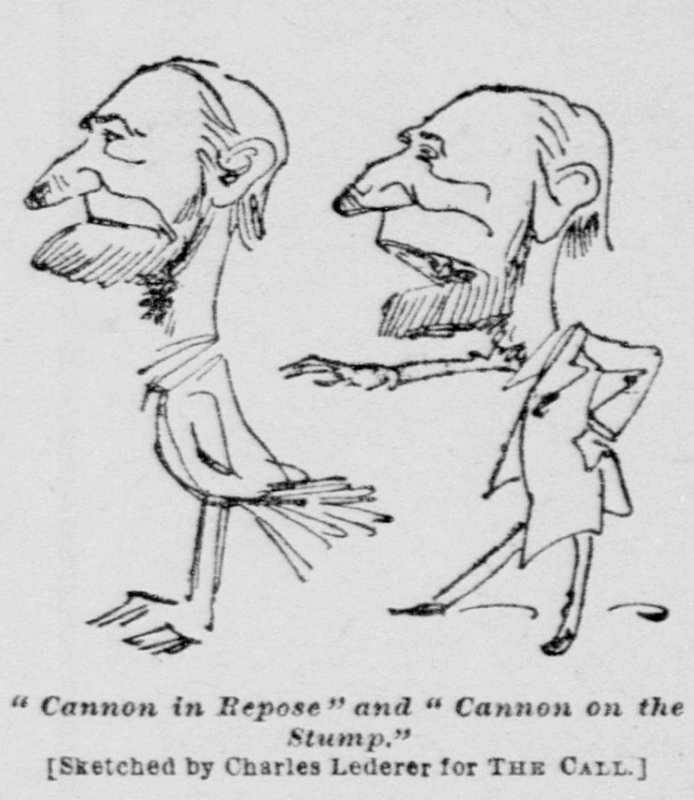 Again the rapid pen flew over the reporters' rough paper, and presently—in less than ten minutes at most—"Cannon in repose" and "Cannon on the stump" were produced. They speak for themselves and give ample reason why the victim of them should be incensed. "But he wasn't angry long," continued Mr. Lederer. "One day an arm was thrown about my neck as I was walking along in Chicago. I looked up to see who it was, and almost trembled in my boots when I saw that great, yawning mouth of Joe Cannon—he has the most striking mouth I have ever seen. "And he opened his mouth to show me. Sure enough, there were four or five teeth, and I had entirely overlooked them. "Whitelaw Reid was an easy mark for the caricaturist—tall and lean men usually are. This is the way I made him—"
A few movements with the scratchy hotel pen and the editor of the New York Tribune was produced. "When one makes a face a good many times it can be done from memory, you know, as well as from the original of a photograph. Once, on a bet, I drew ex-Mayor Roche of Chicago with my eyes shut. "Yes, I think newspaper illustrations have come to stay. When you see such papers as the New York Sun and Herald being compelled to go back to them after giving them up you can depend upon it the public demands them. "They're a great expense and annoyance to the management but an attractive paper can't be run without them. True, a few big papers like the New York Times and Philadelphia Ledger get along without illustrations, but they have rather exclusive circulations and are not so popular as the others. "The pictures appeal strongly to the masses and no paper that caters to the people can get along without them. "Yes; I look for improvement in newspaper illustration, but the improvement will be not so much in the artists' work as in the better methods of reproducing their sketches and in the better ink and paper used. "By and by they will be able to make a cheap paper with a smooth surface. That will help newspaper illustrators immensely. And then I think the time will come when newspapers will be able to reproduce, perhaps by the half-tone process, the illustrations directly from the pen drawings. "How do the San Francisco papers compare in illustrations with those in the East? Very favorably, I think. In many ways their sketches are greatly superior to some of the more pretentious New York dailies." Mr. Lederer and his mother left the city yesterday afternoon for the south, and upon their return here will go back to Chicago. Mr. Lederer had the pleasure of meeting several of the San Francisco newspaper men and artists during his short stay here, and yesterday The Call's artist, Mr. Kohler, made his acquaintance. 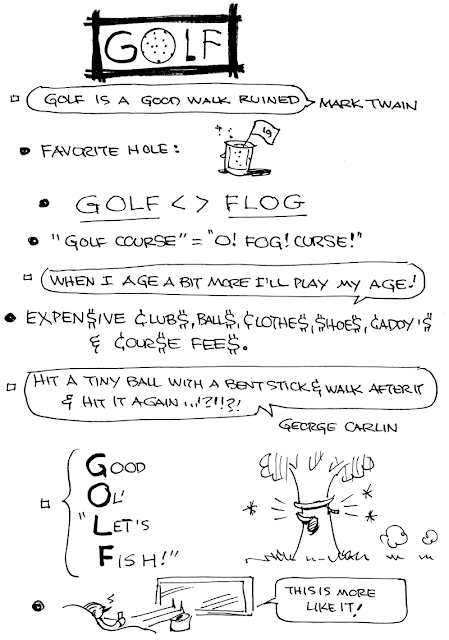 At the request of The Call reporter, Mr. Lederer made a few hurried freehand sketches herewith presented. Charles Lederer was born in Lowell, Massachusetts on December 31, 1856, according to Who's Who in America 1910-1911 and The Book of Chicagoans 1911. In the 1860 U.S. Federal Census, he was the youngest of two children born to Jacob and Bettina; his father was a designer. The family lived in Lowell. In 1870 he and his parents resided in Brooklyn, New York; he was in school. The Book of Chicagoans said he was a "cartoonist and illustrator since 1875 for Frank Leslie's, Harper's, New York World, New York Herald…." …About the only one who had the necessary skill and could give the required lightning action was Charles Lederer, of the Herald, who has the honor of having introduced this brand of newspaper enterprise in Chicago. The son of an artist residing in Lowell, Mass., Mr. Lederer, was born thirty-six years ago, and has been making pictures for a living for the past twenty. He could furnish a barrel of interesting incidents of a variegated career, but won't. He possesses an extraordinary facility, originality, and a gracefulness in drawing. Its most prominent characteristic is its large popularity with the masses, which has done much to place the Herald where it is in popular esteem. He is short, but won't admit it, has the hair and complexion of a stage villain, and has thus far escaped matrimony. He is a great club man, but claims to travel in the goody-goody class. He admits having $4.75 in the bank and $1.69 due and outstanding, under the impression that Mr. Bradstreet would see this notice. He speaks English in a North Clark street dialect. When pressed to give an account of himself he stated that he had struck out at 16 and worked on nearly all the New York illustrated papers and after having been discharged from the same number came to Chicago in 1877. Then he did general designing, illustrating publications from the pinkest of sporty papers to Sunday school books, with great impartiality. In 1883 newspaper illustration was introduced, and he worked on the Mail, Times, Tribune, News and Herald, remaining with the latter since 1885. Besides the regular run of newspaper illustration, he has done "comics," caricatures, and special and humorous writing which achieved much popularity. …he is known all over the country as the great cartoonist of the old Chicago Herald, on which paper he made his reputation. He still contributes a story, for Lederer can write, with pictures to the Chicago Times-Herald on Sunday, but his principle work is now being done on the New York Mercury, the first page of which is daily illuminated with a cartoon from Lederer's pen. His illustrations of various phases of political life in the empire state are attracting considerable attention, and his pictures are already being copied, although he did not commence his work on the Mercury until the first of this month. Lederer's pen is a wicked one, and as a political cartoonist he is a terror to the opposition. Fortunately he is a democrat, from choice and principle, and therefore his thrusts are damaging to the enemy alone. Evidently, Lederer tried his hand at publishing according to a World Herald item published June 4, 1898. Atlantic, Ia., June 3.—Charles Lederer, formerly staff artist on the New York World, has purchased the Messenger printing plant of this city, and will run an independent newspaper, although personally he is a Democrat. Lederer takes possession Monday. The 1900 census recorded Lederer in Chicago, Illinois at 514 North Avenue. His stepmother and a servant lived with him. His occupation was artist. The Book of Chicagoans said he was a "cartoonist and illustrator…for…[the] Chicago Herald and Record-Herald, [and] Chronicle…" For the Chronicle he contributed Red Squab and Maudie's Beau. According to the Book of Chicagoans he married Bertha Adele Mitchell, of Chihuahua, Colorado, September 29, 1907. The couple spent time in Europe. According to a New York passenger list, they returned from Genoa, Italy to New York City on December 5, 1907. For a brief time, he and his wife performed together; a brochure for their performance, Fun with Chalk, can be viewed at the Iowa Digital Library. In 1910 they lived in Chicago at 1115 East 61st Street; his wife was 26 years old. He was a newspaper artist of his "own account". Herringshaw's American Statesman and Public Official Year-Book (1914) had an address for Lederer at 106 North La Salle Street in Chicago, and said he was publisher of American Advance, and art manager for American Illustration and News Service. 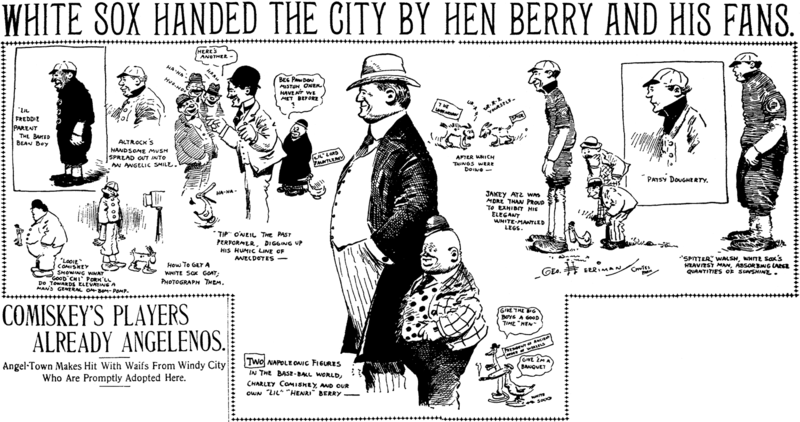 In 1914 he contributed Old Doc Quack to the Chicago Tribune Sunday comics page. 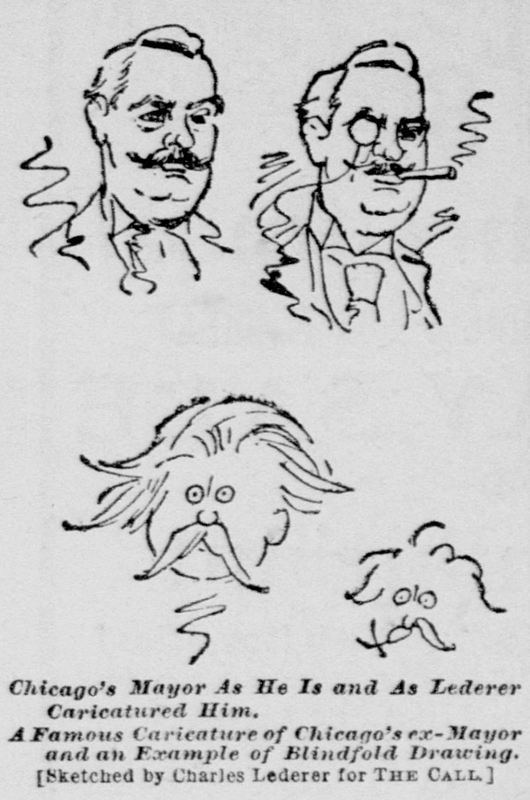 Cartoons Magazine, October 1915, reported his recent endeavors. Charles Lederer, the veteran Chicago cartoonist, accompanied by Mrs. Lederer, has been visiting the Pacific coast. He attended the meetings of the National Educational Association in Los Angeles, and looked in at the Panama-Pacific Exposition. Since his retirement from the active newspaper field, which he entered in the days of chalk plates, Mr. Lederer has been writing and illustration a series of art books for school use. The Rockford Republic (Illinois), October 25, 1918, said Lederer teamed up with actor David C. Bangs. "Lederer does chalk talk stuff while the audience waits, does them in colors and most beautifully, while Bangs recites the works that exemplifies and fully explains the pictures." The art course was advertised in periodicals such as Popular Science Monthly and Everybody's Magazine. In 1923 he produced Turn Me Over. The Chicago Daily Tribune reported Lederer's passing on December 14, 1925; a snippet from the article: "Charles Lederer veteran newspaper cartoonist dies in county hospital at age of 70". Cole Johnson accessed the article and wrote, "Charles Lederer was attacked by Bright's Disease, and was initially hospitalized in Racine, Wis., from there he was moved to the Cook County Hospital in Chicago on Dec. 7. He died there on Dec. 13. 'So far as his friends know, he left no relatives'. A meeting of newspapermen was scheduled to raise funds for his funeral." 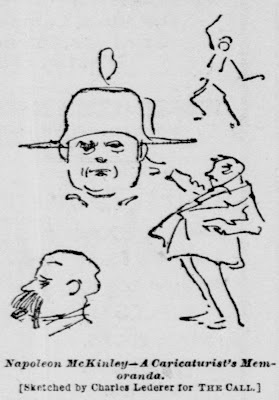 An earlier profile appeared in the Inland Printer, December 1893. I just purchased an original watercolor signed by Charles Lederer on an online auction. It is of a court scene. I read that he was a cartoonist, illustrator. As I read more about him and about the Chicago Tribune sending him to find The location where Christopher Columbus landed, I believe this painting is of Columbus and Isabella. Maybe it was an illustration for a book or magazine? Does anyone know anything about it? I purchased it for $25.00! Please let me know. My email is cvbarnhill@aol.com. Corinne Barnhill - Brandon, Mississippi.